Now Archived! PolarConnect event with Lisa Seff and the 'Upwelling and Ecology in the Beaufort Sea Research Team' held on 14 September 2017. This event was broadcast live from the R/V Sikuliaq located in the Beaufort Sea. You can access this and other events on the PolarConnect Archives site. 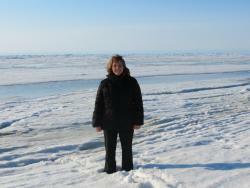 Lisa stands on sea ice near Barrow, Alaska. Photo by Lisa Seff. The Beaufort Sea shelf break experiences frequent upwelling of deep, nutrient rich basin water onto the shelf. Such upwelling is not only a short-term source of heat, salt, and nutrients, and a mechanism promoting elevated primary production, but it also transports populations between ocean regions, potentially modifying ecosystem structure and availability of zooplankton and fish prey to upper trophic level consumers. The Beaufort Sea shelf break is a domain of enhanced abundance of upper trophic level animals, presumably in response to elevated availability of their prey. The team plans to explore and identify the mechanisms linking broad-scale atmospheric forcing, ocean physical response, prey-base condition and distribution, upper trophic level animal aggregations, and climate change along the Beaufort Shelf break. The team's overarching hypothesis is that atmospherically-forced (wind-induced) upwelling along this shelf break leads to enhanced feeding opportunities for intermediate links in the pelagic ecosystem (zooplankton, forage fish) that in turn sustain the exploitation of this environment by animals such as beluga whales, seabirds, and seals. Support for the teacher is provided through the research project funding. Map with Moorings In the Western Beaufort Sea. Courtesy of Carin Ashjian. 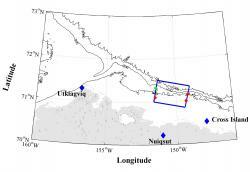 The field work will take place in the Beaufort Sea aboard the R/V Sikuliaq. The Beaufort Sea is part of the Arctic Ocean. The R/V Sikuliaq, pronounced [see-KOO-lee-auk], is a 261-foot oceanographic research ship capable of bringing scientists to the ice-choked waters of Alaska and the polar regions. The Sikuliaq, one of the most advanced university research vessels in the world, is able to break ice up to 2.5 feet thick. Sea Ice in the Beaufort Sea. Photo by Bill Schmoker (PolarTREC 2010) The Beaufort Sea is a sea of the Arctic Ocean, located north of the Northwest Territories, the Yukon, and Alaska, west of Canada's Arctic islands. The sea is named after hydrographer Sir Francis Beaufort. The sea, characterized by severe climate, is frozen over most of the year. Historically, only a narrow pass up to 100 km (62 mi) opened in August–September near its shores, but recently the ice-free area in late summer has greatly enlarged. 18 September 2017 Students Onboard The R/V Sikuliaq! 17 September 2017 Arctic Cod: In Between The Physics, The Zooplankton and The Beluga Whales! 16 September 2017 Where's the Ice? 14 September 2017 Beluga Whales: The Canary of the Sea! PolarTREC teacher Lisa Seff and the "Upwelling and Ecology in the Beaufort Sea Research Team" discuss the many research projects being carried out aboard the R/V Sikuliaq. This event was broadcast live on 14 September 2017 from the research vessel located in the Beaufort Sea. The 1947 Cessna 120 has a service ceiling of 15,000 feet but I’ve only ever gotten it up as high as 10,000 feet. The views of Alaskan mountains at that altitude are absolutely stunning. I learned to fly when I was 18 years old. I’ve had friends who’ve graduated highschool at 17 years old with their private pilot license before even acquiring a drivers license.